Landing your first faculty position isn’t easy, but the work has only just begun. Two McGill researchers have been chosen as CIFAR Azrieli Global Scholars, a two-year appointment designed to support young investigators in the first five years of their careers. 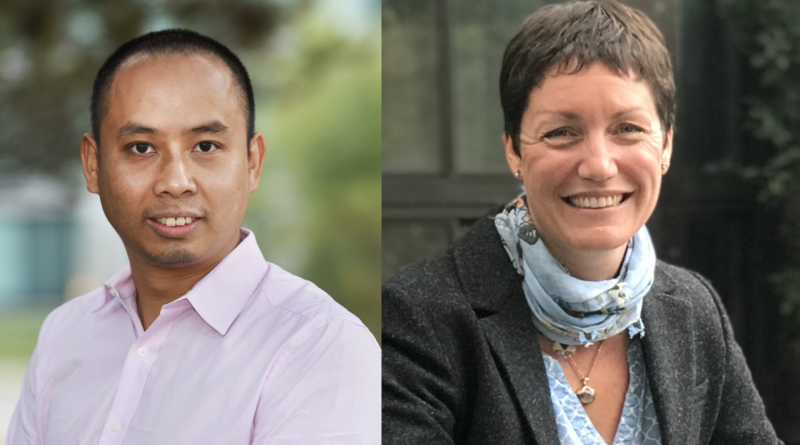 Daryl Haggard, Assistant Professor of Physics in the McGill Space Institute, and Khanh Huy Bui, Assistant Professor of Anatomy and Cell Biology, will join an international cohort of 15 emerging research leaders from the United States, Canada, India, Ghana, and Italy. This is the second year in a row that the prestigious program has selected a pair of McGill researchers to join it. Scholars are chosen for their academic excellence, collaborative work, community involvement and leadership skills. During their two-year appointment, they receive $100,000 in undesignated research support as well as specialized leadership and communication skills training. They will have the opportunity to be mentored by a senior researcher in their field and to network within a community of top-tier research-leaders. Professor Haggard joined McGill two years ago in 2015. She studies active galactic nuclei (accreting supermassive black holes) and their host galaxies. As a CIFAR Azrieli Global Scholar, she will join CIFAR’s Gravity and the Extreme Universe (GEU) program, led by McGill’s own Professor Vicky Kaspi. The GEU program aims to tackle some of the most difficult questions facing astrophysics researchers today, such as, what is the nature of extreme gravity, and how can it help us understand the origin and evolution of the universe? Haggard is optimistic that in the two years she is supported by the program, she will be a part of ground-breaking research in her field, particularly related to multiwavelength, electromagnetic (and gravitational) observations of black holes and neutron stars. “At McGill, I believe we are on the cusp of connecting tests of Einstein's theory of general relativity with the full richness of astrophysics,” she said. “These are exciting times, and the next two years represent an incredible opportunity to make inroads into this new discovery space.” Professor Haggard has been an elected member of the AAS High Energy Astrophysics Division (HEAD) Executive Committee, and an Editor for the AASWOMEN Newsletter. She has participated in visits to the United States Congress to advocate for STEM (science, technology, engineering, and mathematics) research and education. Professor Bui joined McGill in 2015. His research focuses on the structure and function of the cilia, hair-like structures protruding out of the cell, which are responsible for a variety of biological processes. Cilia play such an essential role in the development and function of the cell that cilia-related diseases may result in blindness and chronic respiratory diseases, among other health and wellness issues. By advancing understanding of how cilia function, Professor Bui hopes to improve diagnostic and treatment options for cilia-related diseases. Professor Bui’s objective for his tenure as a Global Scholar is to explore a technique called cryo-focus ion beam (cryo-FIB). By focusing an ion beam to cut into frozen hydrated cells, Professor Bui will look inside the cells using cryo-electron microscopy (cryo-EM), a technique to image biomolecules and reconstruct biomolecular 3D structures that was pioneered by Jacques Dubochet, Joachim Frank and Richard Henderson, winners of the 2017 Nobel Prize in Chemistry. For Professor Bui, the potential of “opening a window into the cell” is as exciting as the opportunity the program provides to expand his research network and to hone his leadership and management skills. The CIFAR Azrieli Global Scholars program is enabled by the generous support of the Azrieli Foundation, which funds scientific and medical research, higher education, youth empowerment and school perseverance, Holocaust education, music and the arts, architecture, and quality of life initiatives for people with developmental disabilities.